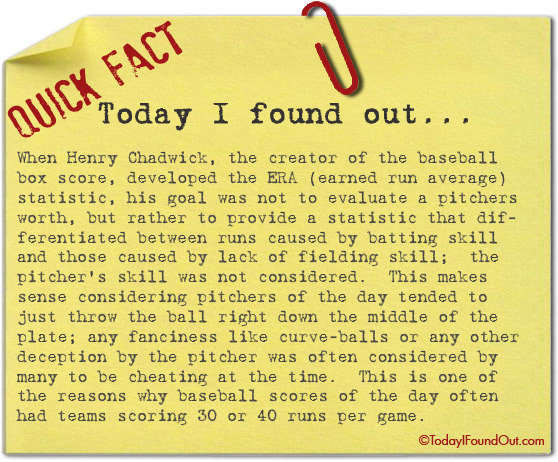 When Henry Chadwick, the creator of the baseball box score, developed the ERA (earned run average) statistic, his goal was not to evaluate a pitchers worth, but rather to provide a statistic that differentiated between runs caused by batting skill and those caused by lack of fielding skill; the pitcher’s skill was not considered. This makes sense considering pitchers of the day tended to just throw the ball right down the middle of the plate; any fanciness like curve-balls or any other deception by the pitcher was often considered by many to be cheating at the time. This is one of the reasons why baseball scores of the day often had teams scoring 30 or 40 runs per game. 30 or 40 runs?! Baseball must have actually been an interesting sport to watch back then! Yeah, JR…it must have been an interesting sport…for people who do not understand the excellent “little things” of baseball. It has always been interesting and remains so today but I guess you have to love the game and be astute to the little things of the game that make it the best game ever invented and loved for over 150 years. Perhaps you would enjoy a game like hopscotch a little better….just might be more interesting to you. I am only having fun trash talking you. I bet it was a fun game back then as well. Keep watching or you just might miss history in the making.